It's Day 13. This is more than a challenge of being in nature. This is a performance challenge. This is a leadership challenge. This is a challenge of integrity. So on Days 10, 11, and 12 I was completely swamped. Family from away were visiting. I spent a full day traveling across the country. And I was putting the finishing touches on a few deadlines. Today, I got my 30 minutes of nature in... at a park surrounded by trees with the sun shining and smiling faces of my niece and nephew playing. I missed my nature!!! And this is the lesson. You fall down. And you get up. Don't make excuses. Just do what you have to do and get on with it. Where have you fallen? Did you get back up? That's the important part... getting back up. 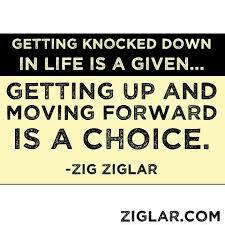 We all get knocked down.